My dogs love to play in our back yard. There are a couple of relatively flat areas on different levels and then a steep, wooded area behind it all. The run and play and play-fight and just have a great time. It was really wet early in the week so I didn’t let them play much – they got so muddy so quick! But then the cold moved back in and the ground froze. This entry was posted in Smile and tagged #weeklysmile, dog play, smile, weekly smile on February 11, 2019 by trentpmcd. Hi all! This was a weird week. i was sick. Boo. thinking of “Boo”, it was also Halloween week, the week of my favorite holiday! And I had a birthday. My birthday was on Halloween, which is one reason Halloween is my favorite holiday ;) I spent several days down at the cottage on Cape Cod. Always a great smile there. Which brings up this week’s smile – Dogs Playing in the Surf. Late Saturday afternoon we took the dogs down to the beach. It was super windy! But it was reasonably warm, in the low 60s F (around 17 C). Well, not warm, but not cold. Jacket weather, but not coat and gloves. or hats – I always were a hat, but I couldn’t in the wind! This entry was posted in Smile and tagged #weeklysmile, Cape Cod, dog play, dogs, smile, weekly smile on November 5, 2018 by trentpmcd. Have you ever watched large dogs playing? The first time can be scary. They growl, show their teeth, etc. But once you get used to it, it’s very fun and funny to watch them. Fiyero and Idina are very rough players, though they rarely give each other nicks or anything – they only get those when they are at Doggie Daycare. It is actually funny to watch them play. This entry was posted in Smile and tagged #weeklysmile, dog play, dogs, smile, weekly smile on July 23, 2017 by trentpmcd. This entry was posted in Photo/Images and tagged dog, dog play, dogs, Photography, Photos, snow on February 27, 2017 by trentpmcd. Some people think anything more than a few months old is ripe enough for a Throwback Thursday post. Those of you who have seen my posts know I usually go back decades. Oh well, the price of age ;) Today is different, I’m going to go back almost exactly 2 years. The picture at the top of the page was taken on the 8th of August, 2014. This entry was posted in Throwback Thursday and tagged boxer, dog, dog play, throwback on August 4, 2016 by trentpmcd. Going through some old pictures I came across the picture at the top of the page. This was taken in the summer of 2006. We were at a place on Cape Cod that took dogs. Some friends stopped by for the afternoon with their 2 kids. 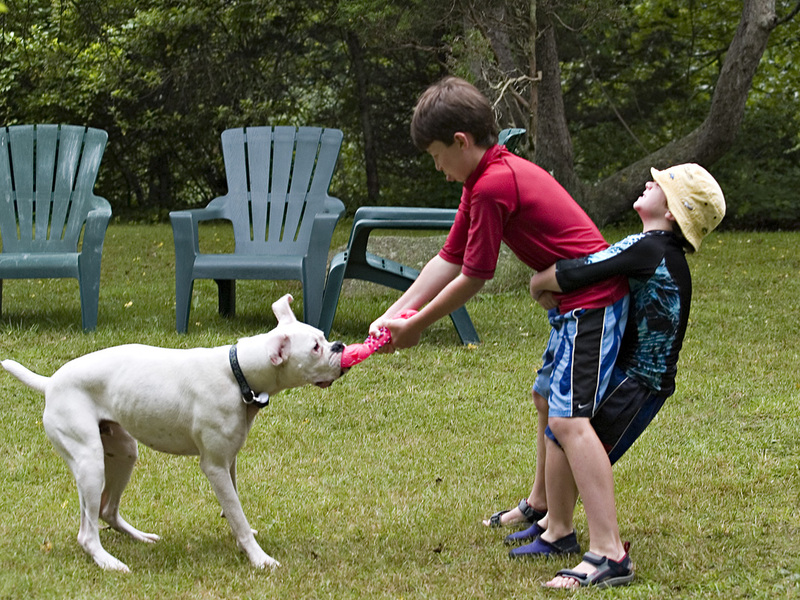 As I was showing them my newest camera, an Olympus E-1, the kids were playing with our white Boxer, Brady. It’s funny because nobody realized i had taken a picture until I sent them this. I like the picture because it can be any kids and any dog, it does matter. It is the play that is the same. This entry was posted in Smile and tagged boxer, dog, dog play, smile, smile a day on December 18, 2015 by trentpmcd. I’ll admit that little makes me smile as much as my furry family members. 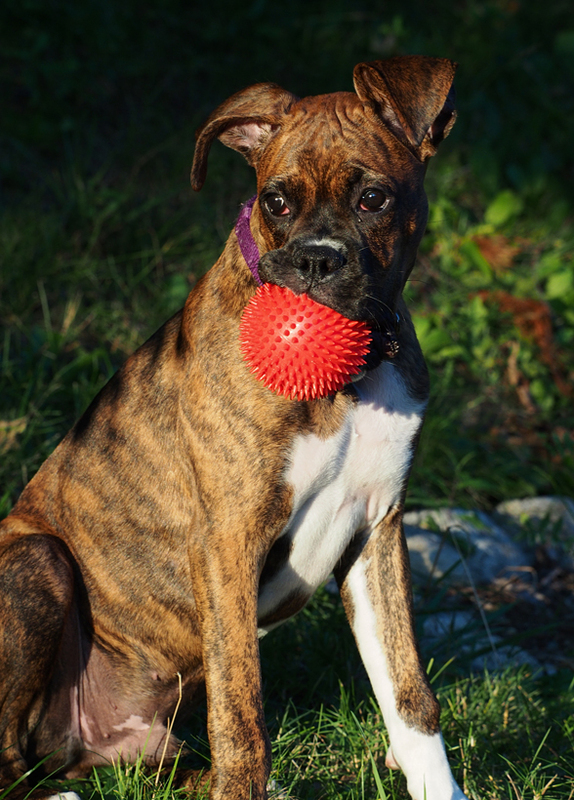 A few weeks ago I posted a video of my Boxer Fiyero chasing a ball down a hill in the woods. It’s one of his favorite games. He also likes to catch the ball. Sometimes he will combine the two activities. He will sit at the top of a hill. I throw the ball. He catches it and then drops it so it rolls to me feet. We repeat. I call it “Lazy Dog Fetch”. It’s hard to see the actual catch in this 8 second video – if you repeat it you may, uhm, catch it. Here is the chasing through the woods video – it’s 38 seconds and set to music, something i now call “Gravity’s Playmate”. Yes, it is my dog, but something about watching him play brings a smile to my face. How about you? Do like to see the enthusiasm dogs can bring to their play? 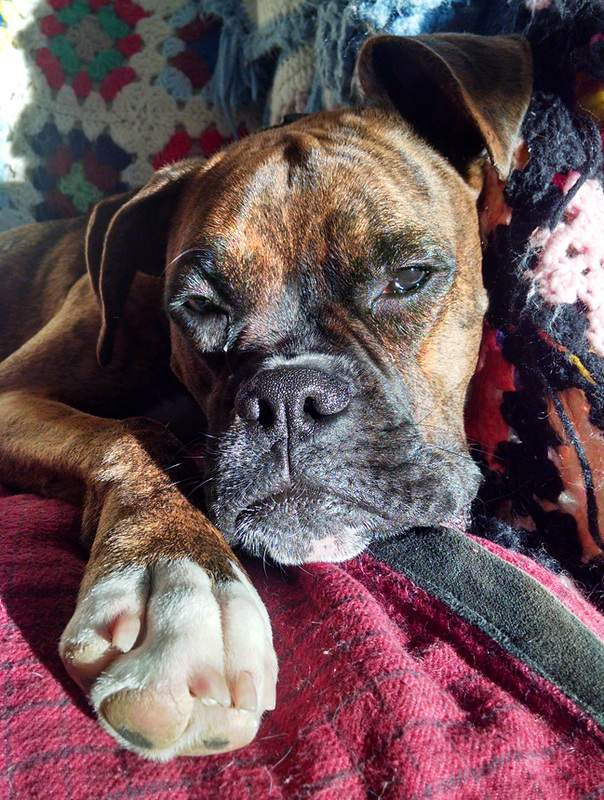 This entry was posted in Smile and tagged boxer, dog, dog play, smile, smile a day, video on December 6, 2015 by trentpmcd.